In Soil Remediation with Cannabis we saw that cannabis is a resilient plant, with the ability to draw up toxins from the soil and remediate contaminated land. Though often touted as a “super weed’ with healing pharmaceutical abilities and numerous industrial offerings, we must not forget that cannabis, at the end of the day, is still a plant. Plants, as living organisms, are not immune to disease. Like human bodies that are constantly thwarting off pathogens, such as the common cold virus, plants are also under constant attack. 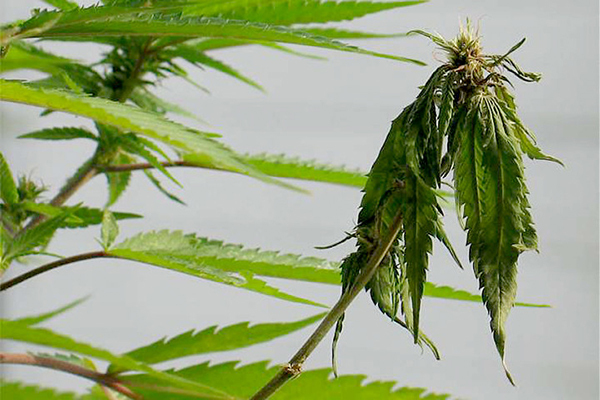 In this article, we will look at five of the most common cannabis diseases that can threaten your plants, and also give some insight into how you can both prevent and treat them if they occur. Diagnosing cannabis disease is not an easy task, as symptoms of infection can be widespread and are often misdiagnosed. Are your plants leaves yellow and wilting? Simply under-watering or overwatering may be the culprit. But then again, so could an unbalanced pH, over fertilization and nutrient burn, improper light placement, or extreme weather – and that’s not even including the pests that cause the majority of cannabis crop losses. Between fungi, viruses, bacteria, animals and insects, there is no shortage of pests looking to dig into your precious crops. If you’re looking for a technical diagnosis of cannabis disease, sending samples for lab testing is the most reliable solution. Certain labs (such as Anandia in Canada and the Sunburst Plant Disease Clinic in America) specialize in cannabis, offering tests designed specifically for detecting microbial contaminants. Another option for diagnosis is to follow the Dichotomous Key of Diseases and Pests. This key takes you through a step-by-step symptom identification procedure, offering over 90 common cannabis pests and diseases. Oh fungi…Not the juicy button mushrooms served over steak at a fancy restaurant, and not the helpful “mycorrhizae” that supplement underground root networks- the following fungi are simply bad news. Pathogenic fungi could be considered the “mafia” of the cannabis pest community- with at least 88 different species that attack cannabis and work in hidden networks to replicate and destroy. 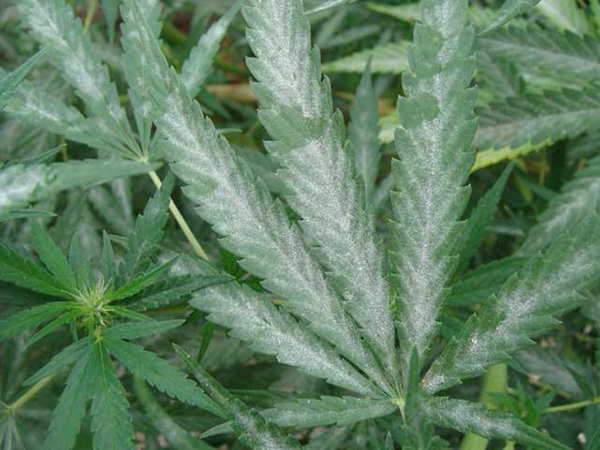 Powdery mildew (PM) is a notorious cannabis pathogen that, when it does show its face, is not hard to identify. With a white-grey powdery substance visible on the plant surface, the presence of PM is certainly alarming. PM is extremely good at spreading, usually from the leaves and plant base, to the bud and flowers- where it essentially renders them useless. Even though PM is very common in cannabis, there is still much that we don’t know about this fungal pest. Though it still is up for debate whether PM spreads over the surface of leaves or travels within the plants vascular system, it is known that PM hinders the plants ability to obtain essential nutrients. There is also a debate on whether consumption of cannabis infected with PM is dangerous to humans (especially in those with compromised immune systems), but no debate on how it spreads (through air and water), and whether it can ruin a crop (YES, it certainly can). Prevention is by far the best way to tackle PM, which thrives in cool, humid environments, with overcrowding and too much water. Keeping a sanitary grow space with good airflow and clean equipment is essential. Regardless of precautionary measures, however, infection is sometimes inevitable. Keeping an eye on young plants and leaves for blistering and strange odour will help catch this infection early, as these signs precede the more obvious white powder. If prevention fails you, there are thankfully a variety of organic treatments for powdery mildew available. 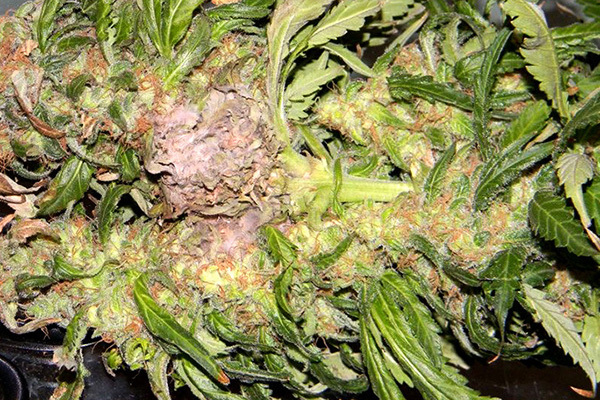 Botrytis is a fungus that affects hundreds of plant species, cannabis included. Though this pest can attack every part of the cannabis plant, it is most commonly found on plant buds in the late stage of flowering. Like our previous pest, thriving grey mold is easily visible to the naked eye, and should prompt immediate action- as its presence can destroy an entire crop in a matter of days. 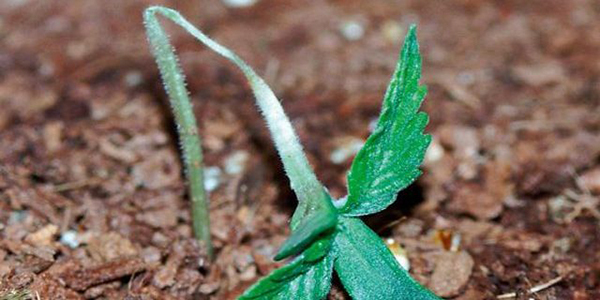 Some would even argue that grey mold is a cannabis growers’ biggest threat. So how do we combat grey mold? Your best bet, like with all fungal infections, is prevention and early detection. Prevention, as we saw with PM, starts with a sanitary grow-space with good air flow and drainage (low humidity), and sufficient space between plants. Early detection can start even before the characteristic cottony-grey buds appear. The first signs of a grey mold infection can be seen in the colour and texture of the plant itself. Leaves appear dry and stems become soft and brown. Early grey mold can also present itself as a powdery white substance, that will darken over time to a grey (sometimes even black or purple) fuzz, and eventually a grey-brown slime. Once visible to the naked eye, the internal damage to the plant is often too far gone for treatment. Your best bet at this point is to remove the infected plants or tissues, in order to prevent contamination to nearby plants. Certain fungi are so good at destroying cannabis plants that, not long ago, they were being considered for use as biocontrol agents to get RID of illegal cannabis crops. Instead of spending valuable time and resources trying to find illegal cannabis crops in Florida, it was proposed that suspected crop areas could be dusted with the Fusarium fungus, a bioherbicide that would essentially find and “eat” the marijuana plants. Due to the ability of Fusarium to mutate and the chance that it could “go rogue” and wipe out other crops, environmentalists protested. We don’t know if fusarium has been used to wipe out drug crops, but we do know that it has undergone testing for its efficacy in wiping out weeds. Fusarium has also been proposed as a biological weapon to disrupt food production and damage national economies. Intense, right? Fusarium is a soil-dwelling fungus that attacks both at the root and leaf level, blocking the delivery of nutrients within the plant and restricting water flow. Fusarium can cause leaves to wilt, with the distinguishing characteristic of dark spots on the lower leaves, which turn yellow-brown before wilting. Collapsed leaves will remain attached to the stem, drooping down, all the way up the plant. Upward curling of leaf tips may also be seen. Fusarium also commonly causes root rot, where roots and eventually the stem turn red inside and burst in areas, inviting in further disease-causing agents. With no effective treatment and its ability to easily spread through soil, water, and air, Fusarium is one to avoid at all costs. 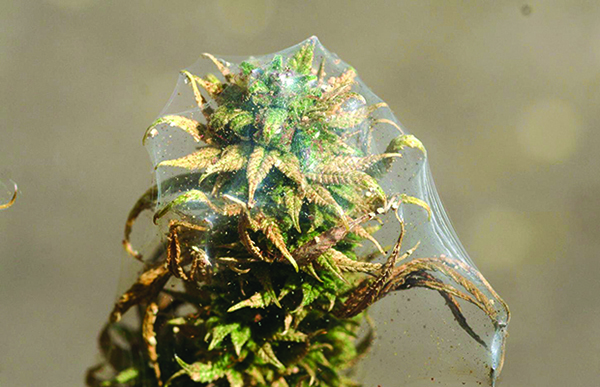 Spider mites are one of the most “cringe-worthy” cannabis diseases you may come across. Not only can these mites give your plants a Halloween-ready appearance, but they are also highly effective at destroying crops and can be extremely hard to get rid of. Early signs on infestation are bite marks on the leaves, which appear as tiny speckles on surface (aka. stippling). Upon close inspection, tiny mites may be seen residing on the underside of the leaf, but unfortunately, most mites go unnoticed. Spider mites are extremely small, and with their eggs being even smaller, infestations often remain hidden until a large amount of damage has been done. Leaves eventually turn yellow, and shortly thereafter, the webs start to appear. Spider mites work hard and fast, so again, your best bet in tackling this pest is prevention. Unlike the previous fungal foes, spider mites thrive in a hot, dry environment. Controlling temperature and humidity are a great way to prevent infestation, as well as consistently following good sanitation practices. Air circulation is also a great way to prevent disease, as spider mites and fungi alike prefer stagnant air. If you do find yourself in a battle with spider mites, you are certainly not alone. There are many options for organic integrated pest management to be considered, with the most popular being organic insecticides and predator introduction. Damping off is a seed and seedling disease caused by a variety of pests, including the Pythium species. In seeds, the infection prevents germination, essentially resulting in “dead” seeds that appear soft and dark in colour. In seedlings, a visible browning at the soil line occurs, which eventually leads to a stem that flops over and leaves that yellow and wilt. Damping off affects seeds and seedlings, destroying your plants before they even have a chance to grow. If your seedlings are showing signs of damping off, your best bet is to remove them to prevent surrounding contamination. As this disease doesn’t leave any time for treatment, we again see that prevention is key. You can prevent damping off by following proper sanitation procedures, and making sure your growing medium is “clean” and not oversaturated with water. Taking precautionary measures to ensure the soil is clear of contamination is a vital first step. As this pest favours moisture, an environment with low humidity and good air circulation is also essential. Sadly, Pythium doesn’t stop at seeds and seedlings. This pest can also cause root rot, which is often hard to detect on plant roots residing in the soil. Symptoms of a plant infected with root rot mimic many other plant diseases and nutrient deficiencies, such as the yellowing of a nitrogen deficiency. The tell-tale sign is in the roots, where you will find a brown slime with a foul odor. Beneficial microbes are one of the most effective ways of preventing and treating Pythium rot, especially at the root level where aerobic bacteria (a product of compost tea) and mycorrhizae reside. A run-in with any of these common cannabis diseases could make even the savviest grower panic- and we have only listed our top five! As with any organic farming, fighting pests is one of the trickiest parts of the job- and with cannabis, it is only going to get harder. With the recent legalization of cannabis in Canada and the increase in crop cultivation that follows, we will also see an increase in the occurrence and severity of diseases. 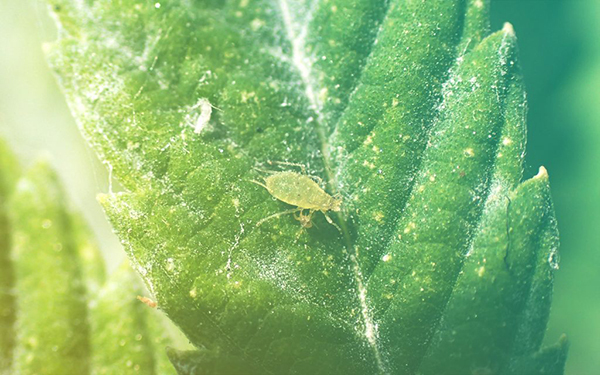 Take the Cannabis Aphid for example, a pest that has just recently shown its face in North America and is preying specifically on cannabis plants. Yet another name to add to our list! As cannabis pests are given more room to “play” in, we will undoubtedly see diseases that will mutate over time. It is also likely that we will discover new diseases that we haven’t had to face before. 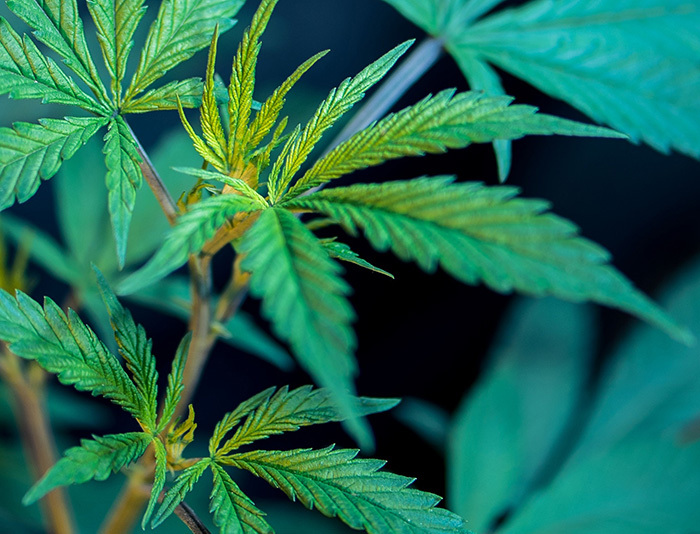 Not only will these diseases threaten our crop growth, but also their functionality, as some plant diseases can threaten the health of cannabis consumers. So how can we protect our cannabis? The old saying “know your enemy” certainly holds true for cannabis diseases. With the illicit nature of this plant, much of its previous production has been secretive. This has led to a lack of documentation on the subject, as secret production results in little regulation and informal study. Today, one of our biggest hinderances in identifying cannabis diseases is the lack of long-term, cannabis-specific pest studies. We need to know exactly what we are up against in order for pest treatments to be specific and thus effective, as prevention is not always an option. Scientists are hopeful on this front, as researchers are finally getting the funding they need to ask such questions. For organic cannabis growers, we are optimistic that this research will lead us in the same direction as organic farming- where products are safe, regulations are clear, and growing is sustainable. We saw in all five cannabis diseases that prevention is by far the best way to tackle infection. Prevention in all cases included temperature and humidity control, good air circulation, and good sanitary procedures. These are all external methods of protection. What we have yet to touch on is fighting off cannabis disease internally. Much like a healthy person with a strong immune system, healthy plants living in healthy soil have a head start in disease prevention. BlueSky Organics offers not just organic soil amendments, but products specifically formulated to provide your plants with all the nutrients and support they need. 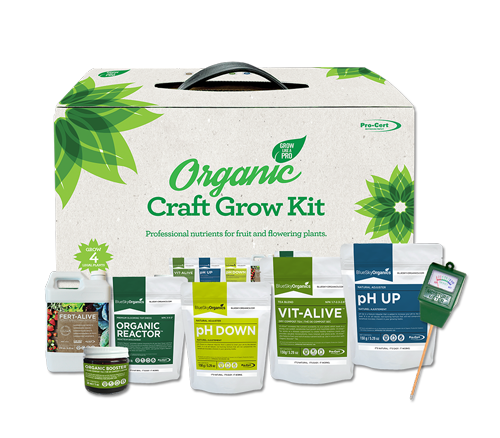 Choose organic growth and let BlueSky help your plants thrive!